A prevailing belief in schools is if we study harder and stay focused during instruction, we will reap the benefits of our extra effort. As the saying goes, what we put in is what we get out. But what if that were not true, at least in the area of how our brain actually learns? Instead, could we change how we learn and improve our memory and skills, without exerting any more effort? The first time I considered this was after reading Benedict Carey’s article for the New York Times Magazine, titled Why Flunking Exams is Actually a Good Thing. The reporter suggests that if we take a test on a topic of which we have limited background knowledge, especially before the actual lesson or unit in school, we will perform markedly better on the summative assessment than if we had not taken the pretest at all. The reason? Even if the question is not entirely clear and its solution unknown, a guess will in itself begin to link the questions to possible answers. And those networks light up like Christmas lights when we hear the concepts again. So I tried this out in the best situation I had at hand: My 5th grade catechism class that I teach every Wednesday evening. After an explanation of the strategy (along with plying them with snacks), we commenced in our experiment. For that evening’s chapter in their textbook, they attempted to answer the questions in the activity book for the reading they had yet to complete. They were frustrated, confused, and probably a little bit suspicious about my educational credentials. But after four nights of applying the strategy of pretesting, we took a unit test. The results: Every student scored at least 85% on the exam. Some kids aced the test outright. Not only great results, but also a wonderful example of having faith. After this initial experiment, I wanted to learn more. 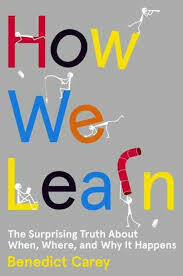 I purchased Carey’s new book How We Learn: The Surprising Truth About When, Where, and Why It Happens (Random House, 2014). The author offers a number of practical learning strategies based on the most current research. He categorizes them within four parts: Basic Theory, Retention, Problem Solving, and Tapping the Subconscious. Although the book was very well organized, when finished, I was hoping for a quick reference guide for each strategy suggested, along with a brief description. Maybe there is something like this on the web. The next strategy I implemented with my CCD students was the use of context when learning. The theory is, if we try to learn the same content in different settings, we are more likely to retrieve that information later on. The reason is our brain often associates what we learn with where we learned it. If we engage in content in multiple contexts and situations, our brains will have multiple ways of retrieving said content from our memories. The environmental “distractions” of where we learn something, such as music, visuals and lighting can actually serve as cues for later retrieval. The more cues we have, the more likely we will remember something. Each alteration of the routine further enriches the skills being rehearsed, making them sharper and more accessible for a longer period of time (64). We applied this strategy to memorizing the Ten Commandments. It is an expectation of all catechism students in the upper grades. We chorally read them, we highlighted the key words printed on paper, and we found a rewording of the commandments that read like a rhyming poem. To delve more deeply into this content, we also formed value line ups. Each student had to place himself or herself along a physically continuum based on whether they agreed or disagreed with a provocative statement I posted. When we take a stance on an issue, we attach meaning and purpose to the subject. This is another cue that can help learners remember information. 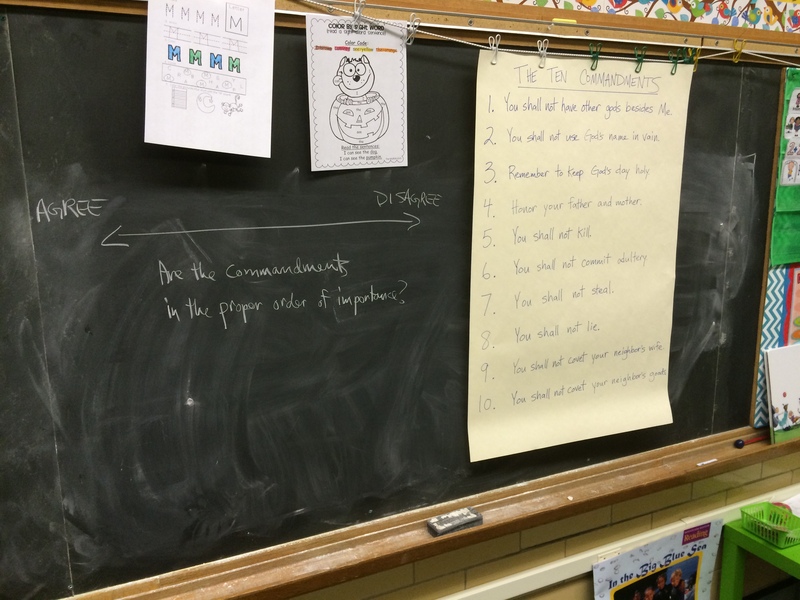 The next week, one of the students was able to recall every commandment with little help. I am not sure yet if the other students have committed the ten to memory, but the next unit test will tell. Regardless of those results, I am convinced that the strategies Ben Carey shares in his book How We Learn are worth exploring. His book would make a great gift this holiday season for that college student or teacher in the family, looking for better ways to maximize learning with the same amount of time and effort. The idea of context/setting when learning was applied during our state standardized tests a couple years ago for our eighth grade students. Previously, due to the time and the parameters of the tests, students were grouped and took the various parts of the test in classrooms with proctors who they may not know and in classrooms they may have never been in before. The next year, we tried to make sure that students took the math portion in their math classroom with their math teacher, English with their English teacher, etc. in the hopes that it would raise test scores. Unfortunately, it’s hard to gauge if the increased test scores had even a little bit to do with this set-up. I’m not sure if this practice has continued with future tests, but it is an interesting idea nonetheless.